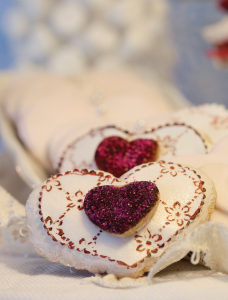 These sugar cookies were crafted and hand decorated by Renee Marze. She drew a quilt pattern on rice paper to create a beautiful, one-of-a-kind cookie that is 100 percent edible. Renee made the ornate cake top in the form of a pink dahlia entirely with Royal Icing. In a large bowl, cream butter and sugar until smooth. Beat in eggs and vanilla. Stir in flour, baking powder, and salt until well blended. Cover and chill dough for at least 1 hour or overnight. Heat oven to 400°. 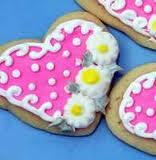 Roll out cookie dough ¼ to ½ inch thick on floured surface, and cut heart shapes with cookie cutter. Place cookies 1 inch apart on ungreased cookie sheet. Bake 6 to 8 minutes. Cool completely on wire rack, before icing. Beat the egg whites with the lemon juice. Add the sifted powdered sugar and beat on low speed until combined and smooth. The icing needs to be used immediately or transferred to an airtight container and refrigerated. Royal Icing quickly hardens when exposed to air, so cover with plastic wrap when not in use. Texoma television has changed, and more change is on the way. Deciphering the channel landscape is daunting. It is like trying to follow one of the latest convoluted thrillers, provided of course, that you can figure out what channel it is on. If you have ever shared an office workspace with women of childbearing age, you will no doubt be familiar with the office baby shower. This is not a suddenly put together affair, but one that occupies hours of planning and coordination on the part of the shower givers.